Eucalyptus Baby Blue- Eucalyptus pulverulenta - Silver Mountain Gum, Silver-leaved Mountain Gum, Silver Gum, Powdered Gum (New South Wales) This species comes from a very restricted area and only a few groves remain in the wild. But it is so common in cultivation that there is no threat to its preservation. This is the species most commonly used for cut foliage production in flower arrangements, and there will always be a high demand for its preservation in the floral industry. 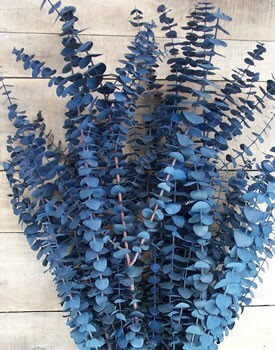 The silvery-grey juvenile foliage is what you usually see when you buy "eucalyptus" at a floral shop or see a eucalyptus wreath prior to treatment. It can tolerate temperatures down to 6 to 13°F before it freezes to the ground.